As we’ve been preparing for our 20th year, we’ve spent a great deal of time visioning and provisioning our company for the future. This has been exciting work, and you can see some of the results of this work here. Communications has never been more important to businesses and organizations, and as we look at trends and needs among our clients, we’re convinced that our new mission statement precisely describes the space we’ll occupy: Creating signature communications that drive purpose and grow business. As an outgrowth of that, we’ve updated our visual brand, and in this entry, we’ll take you behind the scenes on some of the work that led up to this. Navy and gold perfectly represent the classic and timeless attributes of our firm. Orange adds a modern vibe—migrating from the deep burgundy of our previous logo into a more fiery, passionate version of red. Our art director selected several fonts that represented the right mix of modern and traditional. In the end, we selected Optima because it has the dignity, sophistication, and clarity we were looking for. The addition of the dots between the C. the M. and the B harken to our first logo and were added back to help those unfamiliar with our name to say it. We chose Raleway as our body font because of its clean versatility. It also expresses our belief that simplicity must be a central part of any communication. Our signage and business package pair our tagline “Signature Communications” with the short version of our name, "CMBell"—dropping "Company” for the sake of keeping it as simple as possible. Behind each of these was a great deal of research, exploration and internal discussion. Our entire team was involved in the process of reviewing, moving us closer to the final product with each of their insights. This is just one of the things happening as we celebrate year 20 of our journey. If you haven’t read our 20-year story or sauntered through 20 Things We've Learned from 20 Years of Business, we invite you to visit our blog and get some inspiration for your own journey. Getting heard is getting harder. But creating good content continues to be a winning strategy for building strong brands. Whether you want to build culture, increase employee engagement, or win customers, video outperforms all other media in getting viewed and remembered and should be part of your 2017 brand content strategy. Pros: Evokes a feeling about your brand through the artful use of visuals and music without narration. This style is less about persuasion and more about connecting you emotionally to the brand. These work well as the hero video for your website's home page. Pros: Brings your message to life with custom illustrations in almost any style—from casual and fun to sophisticated and stunning. Helps you avoid that moment when you realize that your competitor is using the same stock images that you are. Pros: Great tool to add humor and fun to a topic that might be complex or less than exciting. Can be produced quickly without the need for images or footage. These are ideal for explaining a process or an idea. Pros: This unscripted style can make a leader's message more personal or bring to life a customer testimonial. Affordable to produce. Pros: Lends the credibility of real people doing real life. And who doesn't love a story? Pros: This is a fast, affordable way to bring simple messages to life using motion graphics and music. Great tool for adding impact to websites, digital ads, and e-letters. In its simplest form, this can make you look smart even if you don't have the time or the budget to get great photos. And it can be embellished with photos or illustrations. Pros: Nothing reveals the heart of your organization like a story. These can be built with interviews, narration, b-roll, still images, illustrations, and on-screen text using fresh production techniques and arresting music, but the key is often a good interview. This versatile style is the must-have piece in any company's video portfolio and works well for web, special events, fundraising galas, e-letter marketing, and digital marketing. Pros: Put your old-school PowerPoint presentation on steroids by reinterpreting it as a video rich with visuals, music, and narration. Good for selling an idea, strategy or vision to employees, customers, and shareholders. Wondering how video can help your brand get noticed? Let's talk. Email is a successful communication tool that can improve sales—if done well. Make yours better than your competition and see what happens. And as professional communicators, one of our most significant roles is to keep the purpose of our organization in front of employees, donors, supporters and customers—and to do it in ways that inspire them. We need to be intentional about seeing that messages about cost-control, quality and other business goals do not eclipse the stories that depict the grander purpose of our institution. In this piece, our client took the time to celebrate the successes of a shared goal—a campaign to strengthen the future of their school. We worked with them to express their message visually in the design of a piece that honors the efforts of countless volunteers, donors and employees—and furthers the narrative of the school’s worth. Successes like these inspire and fuel other successes. Let’s be proactive about tending our organization’s narrative. How are you using your communication tools to celebrate your successes and inspire employees, volunteers and donors to work on behalf of your purpose? “Once upon a time,” says the voice from our past, and our imagination swells. From our earliest childhood, we remember stories—even before we knew how they would form our own souls. From Beowulf to modern films like Avatar, this is the story of heroism, triumph over evil and courage. Overcoming the odds fuels hope in all of us, explaining this story line’s historic hold on the human heart. Think Iliad or Lord of the Rings for examples of humans seeking a goal—and overcoming obstacles on the way to victory. Like the quest, the main character searches for something difficult to obtain and returns to tell the story. The hardest ones to execute well, comedies allow us to laugh at our foibles and connect us to our common humanity. Although more difficult to execute as a brand story, tragedy can inspire an audience to action (think “text messaging” PSAs). A threat, an about-face, and the hero becomes something more despite adversity. What human yearnings does your brand story tap into? Some people get hundreds of emails a day, and don’t even attempt to read them all. How can you see that yours get to the “read this” status? We’re sometimes tempted to start at the beginning to tell the whole story, thinking that a reader needs to understand what led to the point. In some cases, this requires too much work for the reader to get to the point, so they jump ship. Start with a summary statement that gives them enough information if they go no further—or a reason to proceed. Potential delay in shipping of the direct mail for Anderson & Evans, Inc. Underline, highlight or change font colors on the key point (deadline, cost increase, action needed). If more detailed back story is imperative, indicate where the reader can find it. Title it clearly and put it at the end, so only those who want it can find it. Could You Be Wrong About What Your Company is Actually Selling? Health care sells peace of mind and hope—not MRIs. Coke sells a feeling. Cars sell image. Banks sell security and peace of mind. These are the deeper motivations of consumers that lie beneath the actual product decision. We worked with Dignity Health to sell lifestyle options in this recruiting brochure and display unit. While they are selling jobs, lifestyle motivations are what drive a physician’s decision to align with an organization. They’ll consider questions like these: How will my family flourish in this location? How much satisfaction will I find with my colleagues? How will I find meaning in my career opportunities? What will my lifestyle look like if I take a career with this clinic? It’s important to reach your audience not just with product benefits, but to address the underlying motivations they have for engaging with you. Creative work developed by CMBell Company and clients has received one gold and one bronze award from the Aster Awards competition. A gold award was given for Dignity Health’s Recruiting Display. A bronze award was given for Littleton Adventist Hospitals 25-year anniversary elevator wraps. Here’s TrackMaven’s take on the best times to post on social media. We found a few surprises here—how about you? People increasingly want to be entertained as part of their communication fare. While there’s a place for this, we caution companies about heading too far down this road unless entertainment is their core business. This is particularly true in businesses and services that are seen as serious, dignified and honorable. When we look for a doctor, we don’t want him/her to treat our situation as light or humorous. Competence and humor can be at opposite ends of the spectrum. While today’s consumer may crave entertaining messages, companies need to think twice before stepping into this realm. It’s possible that lots of clicks and shares of a humorous video can actually be a bad thing, telling the wrong story about your company. Celebrating achievements are important, but corporate milestones represent an opportunity for more than just celebration. They’re a chance to roll-out your story in a fresh way—to revitalize your brand. 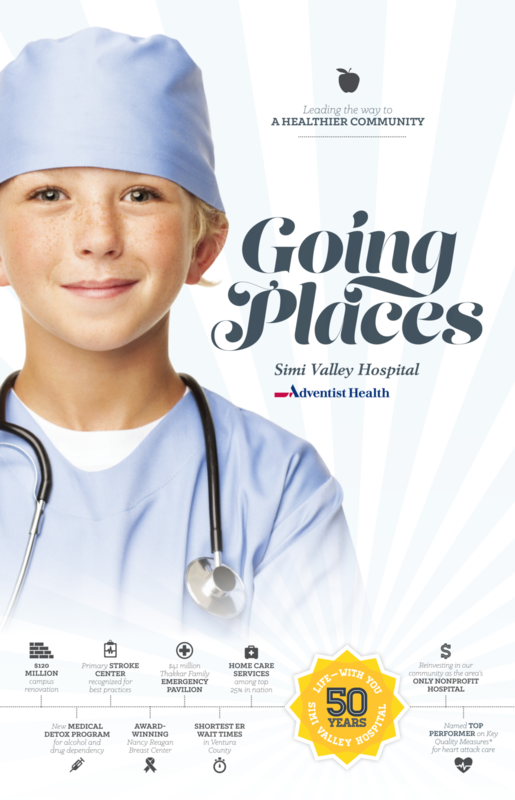 We worked with Simi Valley Hospital to pull together their signature messages about quality and growth, then developed a year-long plan to deliver those messages as part of their anniversary campaign—making the milestone work harder for them and getting more for their investment. The Oregon Alliance of Independent Colleges & Universities is taking a proactive stance to show how private colleges benefit students, communities and their state. We’ve worked with them to make their case and bring their messages to a variety of media—from video and social media messaging to handouts and easy reference wallet-sized cards. Creative work developed by CMBell Company and clients has received one platinum, two gold and one honorable mention award from the MarCom Awards competition, an international marketing awards program. A platinum award was given for Walla Walla University’s Student Employment Kit. A gold award was given for Key Technology’s 2013 shareholder’s presentation video. A second gold award was given for one of many videos produced for LA-based White Memorial Medical Center’s Centennial Gala Celebration program. The honorable mention award also went to White Memorial Medical Center, for another video created for their centennial celebration that honors employees. Judges are industry professionals who look for companies and individuals whose talents exceed a high standard of excellence and whose work serves as a benchmark for the industry. More than 6,500 entries were submitted from throughout the United States, Canada and 15 other countries.